A soft, moist and rum-fragrant bread. 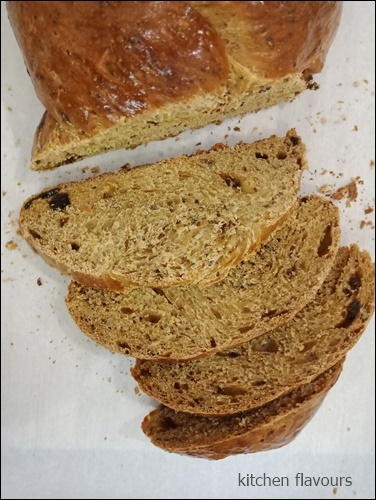 Raisins are soaked with half cup of dark rum, then mixed with the rest of the ingredients to form a dough. Let rise until doubled in size, then punch down and divide the dough into three. Roll each piece into a long rope, then braid them together, let rise again until doubled in bulk. Brush the top with egg wash, bake for 35 minutes until golden. Some of the raisins got mashed up during the kneading process in the stand mixer. But I thought that is a bonus, as the crumbs are deliciously flavoured with the raisins. I have omitted the glaze drizzled over the cooled braid. The braid is soft, moist, lightly sweetened from the mashed raisins, and fragrant from the rum. Lovely eaten as it is and makes a wonderful toast, spread with salted butter with a cup of hot coffee for breakfast. Place raisins and rum in a small bowl, stand for 30 minutes. Combine milk, brown sugar and yeast in a small bowl. Stand in a warm place for 10 minutes or until mixture is frothy. Stir in butter. Combine flour and salt in a large bowl of an electric mixer fitted with a dough hook. Add yeast mixture, raisin mixture and two-thirds of the egg (reserve remaining egg in the fridge). mix to a sticky dough. Continue mixing dough with mixer for 10 minutes or until smooth and elastic. Transfer dough to an oiled large bowl; cover with plastic wrap. Stand in a warm place for 1-1/2 hours or until dough has doubled in size. Grease an oven tray. Punch down dough with your fist; turn onto a lightly floured surface. Divide into three portions. Roll each portion into a 35cm (14 in) long rope. Place dough lengths on oven tray, pressing the tops together to join; cross lengths over and under each other to form a plait. Press ends to join; tucking ends under. Cover with oiled plastic wrap. Stand in a warm place for 1 hour or until dough has doubled in size. Brush braid with reserved egg. Bake for 35 minutes (I baked for 42 minutes), or until golden and sounds hollow when tapped on base. Transfer to a wire rack to cool. Sift icing sugar into a small bowl; stir in extra milk. Drizzle glaze over braid. 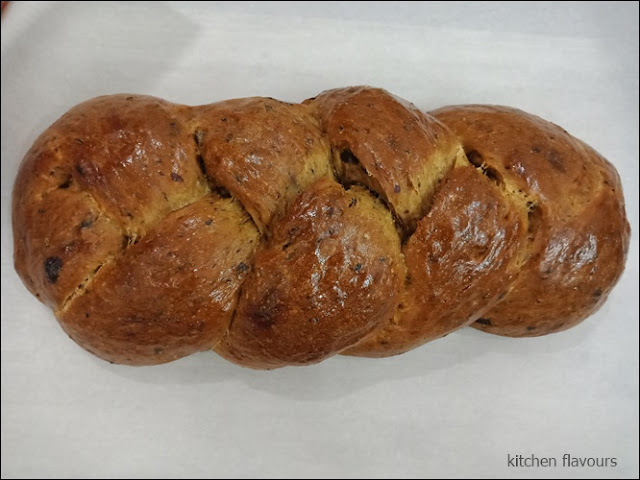 Rum and raisin always remind me of holidays :-) Your braided loaf looks stunning, Joyce. This looks and sounds delicious Joyce, love this braid !